If Your Dumpster Doesn’t Have A Hinged Door And You Can’t Seem To Reach Over The Top Of The Wall, Consider Buying A Step Ladder Or Creating Steps Using Solid, Durable Items Like Concrete Blocks! The likelihood that you will encounter this scenario is slim because most dumpsters have hinged access doors on the back of them or are low enough to the ground that you should be able to reach over the side. However, your dumpster position could have been limited and maybe you can’t access the door or yours is an older model that doesn’t come with one. In such circumstances, you have to be a bit creative and add a foot or two to your reach. You can accomplish this in several ways but the easiest and safest way is to use a step ladder. If you don’t already have one, you can find them in home improvement/hardware stores, mass retailers and many grocery stores. There are actual metal step ladders or they have single step ones made from the most durable plastic. Some of the single step ones even fold up for easy storage. They can range in price from $10 to $400 depending on what you need and how complex you want to get with it. In a pinch, you can make a step or two using materials you might have on hand but be warned: this is not the safest route to go. You can risk the items moving, sliding, shifting, crumbling, breaking or toppling over. If this is the only option you are going to take, try and keep your materials on flat, even ground and make sure they don’t skid across the surface. Only use items that can bear significant weight such as concrete blocks or heavy wood blocks. Do NOT use cardboard, plywood or thin materials of any kind because you will fall right through and injure yourself on the broken object or risk having the debris you are hauling fall on top of you. We strongly urge you to consider only using an actual step-ladder or safety step option but, if you create a step option yourself, please be careful and realize the dangers that could occur. Our Dumpster Tip of the Week is Courtesy of the Naperville Dumpster Rental Service! Thanks, Gang! Same Day Dumpster Rental Now In Schaumburg! The Truth Behind Those Easter Traditions! During Colder Months In Regions Prone To Snow, Always Wear Gloves To Avoid Contact Between Your Skin And The Metal Dumpster Rental! You probably never thought twice about that trash you hauled to the curb but the sick truth is that it will be back like Arnold Schwarzenegger. The only tough decision in renting a same day dumpster is trying to figure out what size is needed for your project but this rule of thumb can guide the way. 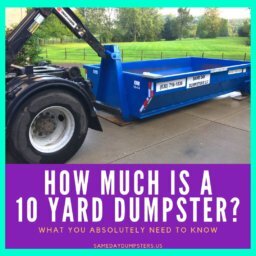 How Much Does It Cost To Rent A 10 Yard Dumpster? The 10 yard residential and commercial dumpster rental from Same Day Dumpsters offers a reasonable price and multiple benefits to accommodate project needs. Depending on your project and the amount of waste you output, Flat Fee pricing is probably the best solution when renting a dumpster. Happy National Throw Out Your Leftovers Day! You’ve had time to make your way through those Thanksgiving leftovers but it’s officially time to throw in the towel and toss them out! We here at Same Day Dumpsters wish you and your family a very happy and healthy Easter holiday! Start New Year off right by keeping these BRRR-eautiful tips close by to blast through those special projects and eliminate stops at Procrastination Station! A General Permit For Home Improvement Work Does NOT Cover A Dumpster. Check With Your Village To See If Dumpsters Require A Permit! The Same Day Dumpster December weekly calendar fun fact has to do with a horde of 20,000 bees chasing after a grandmother’s car for two consecutive days! In this question series, we highlight the key factors one needs to consider when faced with the arduous task of choosing the right company for your project. Same Day Dumpster Rental Now In Naperville! Same Day Dumpsters is proud to announce a new location in the beautiful and historic western suburb of Naperville, Illinois! Take extra precautions when working on home renovations to keep your work space clean and harmful pollutants out of the air. Not every facility knows how to properly get rid of e-waste but a dumpster rental service near you might be able to handle disposing of these items correctly.